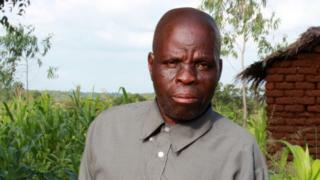 On death row in Malawi, Byson Kaula was nearly executed three times - but on each occasion the hangman stopped work before hanging all the prisoners on his list. So he survived… until the country stopped executing people altogether. "That is when my sad times began," he says. Neighbours attacked one of his employees, Byson says, leaving him badly injured. The man couldn't walk without assistance, and while helping him get to the toilet - navigating steps that were slippery after heavy rain - Byson fell and dropped him. The man died later in hospital, and Byson - then in his 40s - was charged with murder. In court, Byson's neighbours testified against him. His mother, Lucy, sitting at the back of the courtroom, couldn't hear the sentence being read out and had to ask what was happening. When she was told he had been sentenced to death, "tears rolled from my eyes down my chest," she says. This was towards the end of the totalitarian government of Hastings Banda, which had controlled the country since 1964. Byson vividly remembers the horror of waiting for his turn at what he calls "the killing machine". "When I was told: 'You can go now to the condemned section waiting for your time to be hanged' - oh, I felt as if I was already dead." At that time, there was just one executioner - a South African who travelled between several countries in the region, carrying out hangings. When he arrived in Malawi, once every couple of months, the prisoners on death row knew that time, for some of them, had run out. One day Byson remembers being told that his name was on the list of 21 people to be hanged within hours. A guard told him that executions would begin at 13:00 and that he should "just start praying". They continued until 15:00, when the executioner stopped work. But he had not reached the end of the list. Three people, including Byson, would have to wait until he returned. "He was the only one operating that machine. And on that day, I understand he said: 'No it's too much, I'll come again next month,'" Byson says. The same thing happened twice more, Byson says. The list was drawn up, but the hangman didn't finish it - and each time, by chance, Byson was among those left alive at the end of the day. On the third occasion, all the prisoners on the list were executed except him, he says. In a way he was lucky, but the experience took its toll on him and he attempted suicide twice - only to survive this too. Then, in 2007, a historic case changed everything. A drug user who admitted killing his stepson, but argued that he had been temporarily insane, went to court to challenge the mandatory death sentence for murder. He argued that this breached the right to a fair trial, and the right to protection from "inhuman and degrading treatment" - both guaranteed by Malawi's constitution - and the court agreed. In some cases of murder the perpetrator was more culpable than others, it ruled, and there should therefore be different levels of punishment. Of nearly 170 prisoners eligible for resentencing, 139 have so far been released. According to the legal charity Reprieve, many had mental health problems or were intellectually disabled. More than half of those entitled to a new hearing turned out to have no court record at all - it was unclear why they were even in prison. "The prison warders said can you get out of the accused box. But I couldn't stand up. I was just shivering, all my body was so weak… It was just as if I was dreaming. I could not believe what the judge had said." Byson wasn't the only person whose life had been changed by his sentence. His mother Lucy had visited every year during his incarceration. She would save her earnings from a year's work farming cotton to make the journey to the prison in Zomba, bringing Byson as many provisions as she could carry. On the day of Byson's resentencing in 2015, she wasn't there, but her younger son was. When he rang to tell her the news, she took a while to believe what he was saying. Then, she says, she "jumped around like a lamb - a young lamb… my heart was filled with joy". Byson was taken to a halfway house to help him learn new skills and make the transition back to normal life after 23 years in prison. Already in his 60s, he was the oldest person they'd ever had there. "During my imprisonment, all I was worrying about was my mother… Being her first-born, I would do everything possible for her. Now that I'm back, I don't let her go farming or do hard jobs. I have got other people to do the jobs for her. She doesn't go to the field. I do it myself." Just over a year ago, Greek pilot Vasileios Vasileiou checked into a luxury hilltop hotel in Kabul. The Intercontinental was popular with foreign visitors - which is why, on 20 January, Taliban gunmen stormed it, killing at least 40 people. Vasileios explains how he survived.